Good. 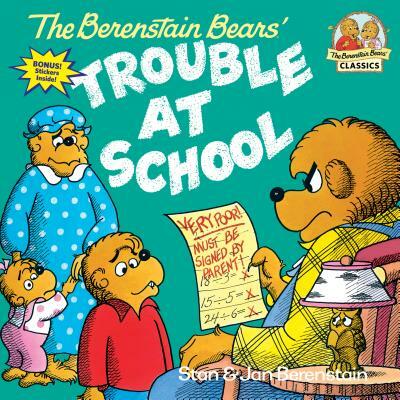 The Berenstain Bears Trouble at School# (First time books) (Berenstain Bears First Time Books) by Berenstain, Jan, 1987-11-01. Trade paperback (US). Picture book. Glued binding. 32 p. Contains: Illustrations. Berenstain Bears First Time Books. Intended for a juvenile audience. New. 039487336X Ships from Tennessee, usually the same or next day. This book seemed made for me. I often got poor grades in math. I understood Brother Bear's problem quite well. The ending is a bit sugar coated, but expected in a kids book. This book is more realistic than past books. Papa Bear does get angry at Brother Bear until Grandpa Bear steps in. The angry parent might scare very young sensitive children, but most won't be upset. The Berenstein Bears is a great series for children that teaches them useful life lessons.